Solarize Northwest is excited to announce our first-ever Spanish language workshop in partnership with Nuestra Casa and Yakima Valley Conference of Governments. The workshop in Sunnyside, WA will cover the Solarize program, the best solar sites, costs and financing, and next steps for solar. 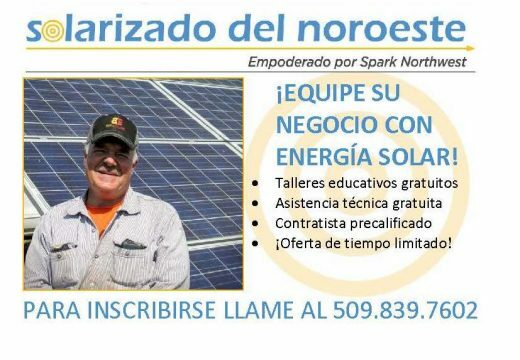 The workshop is aimed at local Spanish speaking business owners who might be interested in solar, and also open to homeowners. We will also provide follow-up technical assistance applying for USDA REAP grants to help cover the cost of solar for small businesses. 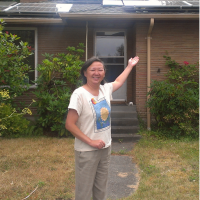 Solarize South County is a group purchase program that simplfies the process of going solar and helps participants save money through a community group purchase. A volunteer committee has selected a local solar installer, Kinter Electric, through a competitive process to provide group purchase installations during the campaign. The workshop will be presented on December 5, 6:30-8pm at 906 E. Edison Ave, Sunnyside, WA. Participants can register for the workshops by calling 509-839-7602. Conozca los mejores sitios para la energía solar, cuánto cuesta e incentivos disponibles. Conozca a un contratista precalificado, inscríbase para una evaluación gratuita del sitio y averigüe si califica para una subvención REAP del USDA.